To find out more about Rotary join us at one of our Upcoming Events. Visit our calendar to view all open sessions to the public and details for any changes to our weekly meeting. Rotary Act of Kindness Weekend. 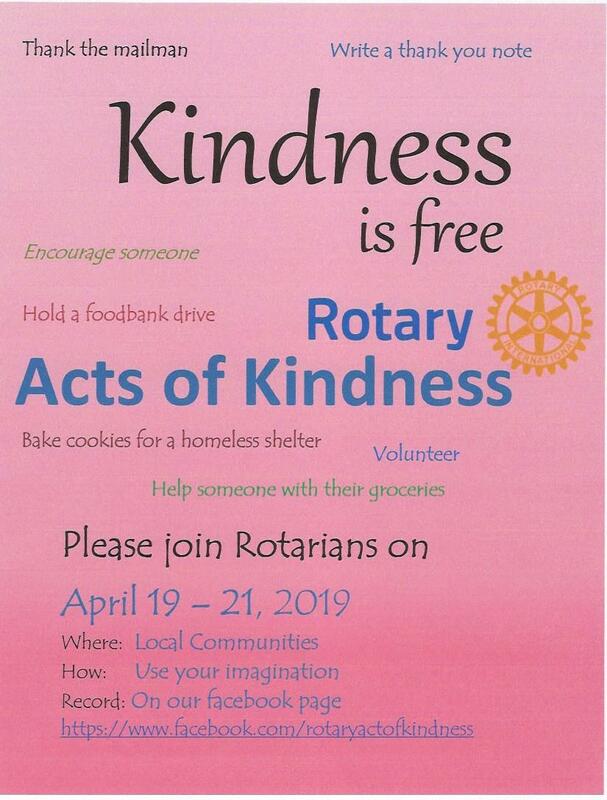 The Rotary Club of Burnaby would like to invite you to join us for our first Rotary Act of Kindness Weekend. We are inviting all Rotarians, family & friends to join us in an act of kindness. This can be organized or random and performed in your local neighbourhood. Mayor of Burnaby Mike Hurley speaking at Fair Haven Seniors' Housing in Burnaby. Rotary Club of Burnaby raised $30,000.00 for a fitness and garden complex. Seniors in need of affordable rental housing in Burnaby now have access to 145 new homes to live in. "Too many seniors, especially those on fixed incomes, are being squeezed out of a tight rental market," said Raj Chouhan, MLA for Burnaby-Edmonds, in a news release. "I am thrilled for the seniors who have a new place they can afford. Our government is working hard to create the partnerships needed to build even more projects like this to help people find a place to call home in their community." The Moscrop Interact Club of Burnaby was officially chartered on May 29th 2018 at Moscrop High School. 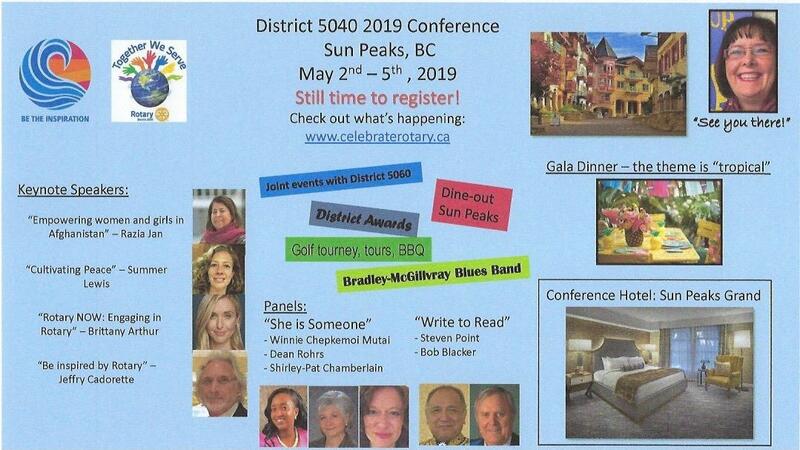 It is sponsored by the Rotary Club of Burnaby and the Rotary Club of Metrotown. Rotarians in Action! Once a month members from the Rotary Club of Burnaby prepare eighty lunches for clients of The Society to End Homelessness in Burnaby. This is half of the amount prepared with another eighty lunches prepared by volunteers at Southside Community Church. The lunches are then distributed at Southside Community Church the following day. Click on the photo to check out our 2017-18 photos for the year. Click on the photo to check out our 2016-17 photos for the year. Rotaract brings together young people ages 18-30 in universities and communities worldwide to organize service activities, develop their leadership and professional skills, and have fun. Rotary clubs sponsor them, but Rotaract club members manage and fund their clubs independently. The Rotary Club of Burnaby is a proud sponsor of the Rotaract Club of Burnaby. Rotary World Help is a non profit organization aimed at collecting and distributing medical equipment & supplies, dental, optical, education & sports equipment and disaster relief supplies to international recipients in need. They are a non-religious, non-political charity run by Rotary Clubs from British Columbia, Canada. It all started in 1992 when District 5040 sent a delegation of Rotarians to the former Soviet Union to assist with establishing the first Rotary Club in Kiev ... The rest as they say is history.